DELIGHT PRO with CES – Light and Sound Mind Machine. The Delight Pro by Mind Alive combines the benefits of pulsed light, pulsed sound and CES. It is our most popular mind machine. Very simple to use, extremely effective and is the number one choice for alleviating stress, getting to sleep, life changes and in general, making a good thing better. DELIGHT PRO with CES – Light and Sound Mind Machine, also known as brain machine, dream machine and psychowalkman. The Delight Pro by Mind Alive combines the benefits of pulsed light, pulsed sound and CES. It is our most popular mind machine. Very simple to use, extremely effective and is the number one choice for alleviating stress, getting to sleep, life changes and in general, making a good thing better. A NON-PHARMACEUTICAL APPROACH TO INCREASED WELL BEING DAVID Delight Pro – AVE with CES all in one easy-to-use device! Free Fedex shipping in Canada and United States! Michael Landgraf and Christopher Oliver, the operators of Mindmachines.com, personally use the Delight Pro regularly, for different applications, and enjoy knowing it achieves what the manufacturer, Mind Alive Inc., intended. We sponsor several learning relaxation programs, in many different fields, and the response has been both positive and emotionally rewarding. The Delight Pro is beneficial, it has improved the attitude and wellness of so many… it would be a welcome addition in everyone’s life. The built-in programs: The Delight Pro light and sound mind machine features five distinct categories of sessions: Energize, Meditate, Brain Brightener, Sleep and Mood Booster, with five selections for each category. It also includes five auto playing Sound Sync Sessions and five locations for you to store sessions you design with the Delight Pro session editor. Also includes popular 100 Hz CES with any session. The Delight Pro also features night-vue ability, which allows the user to see the session select buttons in the dark at bedtime or at night. 25 preset sessions – Five sessions in each category: Energize, Meditate, Brain Booster, Sleep and Mood Booster. Sound sync sessions – Each category also has a Sound Sync Session to turn your music into an intriguing light show. All sessions include HRV and begin with a 3-stage process that enhances dissociation. There are sessions in all four brainwave groups: beta, alpha, theta and delta. Visual stimulation: The unique Tru-Vu Omniscreen light frames (strobe light goggles) are carefully designed to provide you with the most effective and safe light and sound experience. This special patented process allows the Delight Pro to stimulate a different frequency in each hemisphere of the brain. This is essential for mood boosting and mental performance. The Tru-Vu Omniscreen lightframes for the Delight Pro use eight blue-tinted white LEDs mounted over a silver reflector behind a translucent screen. This disperses the light evenly. Our Tru-Vu Omniscreens are specially designed to allow for the left and right visual fields of each eye to be individually stimulated rather than the entire eye. With the Tru-Vu Omniscreen lightframes, the lights flash into the left visual fields of both eyes, then alternately flashes into the right visual fields of both eyes. This approach allows the ability to stimulate either visual cortex with a frequency different from the other visual cortex. For example, a person who functions strongly from the left brain could have 8 Hz stimulated into the right visual field (and therefore the left brain) to slow down left brain function and have 18 Hz stimulated into the left visual field to increase right brain function. Audio stimulation: Isochronic Pulsed Tones, Binaural Beats and Monaural Beats – The isochronic pulsed tones are evenly spaced, are of equal pitch and are turned on and off at a specified rate. This is important to enhance the effectiveness of audio entrainment. The monaural beats are similar to the isochronic pulsed tones, but turn on and off more gently and therefore are smoother, fuller beats and are recommended for those who find the pulse tones too stimulating. The binaural beats are two pure tones (one in each ear)and are mentally perceived to have a single beat. CES stimulation: Add cranio-electrical stimulation to any of your sessions. With the 100Hz feature and no gels or lotion necessary for the earclips, enjoying a light, sound and CES session has never been easier! 515 virtual Mindmachine contains five dual independent binaural beat audio frequency session tracks designed for listening through headphones or speakers. The 515 virtual Mindmachine Energize (Beta) MP3 Session is 10:09 minutes in length. The session is in dual independent binaural beat frequencies in the Beta and Beta/SMR brainwave range for increased mental and physical performance. The 515 virtual Mindmachine Alpha MP3 Session is 20:16 minutes in length and features dual independent binaural beat brainwave frequencies. Session frequencies range from 8-12Hz and is ideal for relaxed yet focused concentration. The 515 virtual Mindmachine Theta MP3 Session delivers brainwave frequencies in the 4-7Hz range via dual independent binaural beats. Session length is 10:10 minutes and useful for learning, memory and dealing with jet lag. Our 515 virtual Mindmachine Alpha / Theta MP3 Session is a 7:10 minutes long brainwave frequency audio program utilizing dual independent binaural beats in the 4-12Hz state of consciousness. The combination of accessing both states of consciousness is for inner-thought enhancement and creativity. 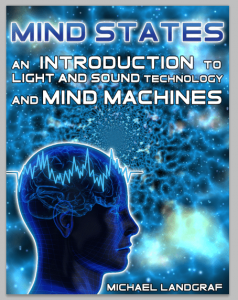 And our 515 virtual Mindmachine Delta MP3 Session is a 26:10 minutes long brainwave frequency session designed for going to sleep. Use with speakers with the volume set no higher than the hum of a fluorescent light. The dual independent binaural beats utilized in designing this session range from .5-3Hz. Soft-OffTM – The gradual lowering of the lights and tones at the end of the session prevents a startle response (also known as somnatic shock). Soft-Off ensures that relaxation and other benefits carry over even after a session has ended. Battery Power Indicator – At a quick glance you can tell if your battery has enough power to run your session. The new Delight Pro lightframe technology allows for much longer life for your 9-volt battery. Easy-To-Find Power, Intensity and Volume Buttons – The power, intensity and volume buttons are raised so that you can make the necessary adjustments easily and quickly, even with your eyes closed. Adjust the intensity of the Omniscreen lightframe with the easy-to-find INT button. The Delight Pro features larger easy-to-read, easy-to-operate buttons and allows users to select a session very easily. Your questions and concerns can be answered quickly via internet email or phone call to mindmachines.com. Isochronic Pulsed Tones, Binaural Beats and Monaural Beats – The isochronic pulsed tones are evenly spaced, are of equal pitch and are turned on and off at a specified rate via headphones. This is important to enhance the effectiveness of audio entrainment. The monaural beats are similar to the isochronic pulsed tones, but turn on and off more gently and therefore are smoother, fuller beats and are recommended for those who find the pulse tones too stimulating. The binaural beats are two pure tones (one in each ear)and are perceived to have a beat. 25 Preset Sessions – Five sessions in each category: Energize, Meditate, Brain Booster, Sleep and Mood Booster. The Delight Pro has the same sessions as the Delight Plus mind machine, but also offers Cranio-Electro Stimulation (CES). The frequency of the CES sessions are linked to the frequency of the AVE sessions plus 100 Hz. You can use AVE by itself, CES by itself or both together. LoopLogic Hz Dual Independent Binaural Beat MP3 Session Generator is an instant download MP3 file set broken into Gamma, High Beta, SMR, Beta, Alpha, Theta and Deltaaudio brainwave frequency categories. Each of the 37 tracks represent one hertz within each category and is created with dual independent binaural beat frequencies. Simply add these frequency tracks to your MP3 Player or playlist and program your playlist to create custom audio brainwave entrainment sessions. Try the Delight Pro for altered states of consciousness and shamanic experiences or use with electroencephalography instruments like biofeedback or neurofeedback to chart brainwave frequencies for brainwave synchronization, human enhancement, evoked potential, induced activity and ongoing brain activity. Mind machines are not construed as medical devices by the FDA. Photo-sensitive individuals and those with epilepsy risk seizure when using a pulsed light device.